OCC have yet again postponed the meeting to consider the quarry planning application. It will now NOT be on 15th April. The next possible date is Monday 3rd June at 2 pm. Please pencil it in your diary. strength of your opposition to this quarry. Your presence in that room will count again. It is certainly possible that the date for the hearing will slip again. We will keep you informed on this website and by email. Collectively we defeated Hills then and we can defeat them again. The reason for the delay? Hills are reviewing the height of their bunds because of the harm to the Green Belt from their plans, but it remains to be seen how any changes to these will protect the local community from noise and visual impacts which the bunds were deemed necessary for. If changes are made to the bunds there will be need to be a further round of public consultation before the application goes to the planning committee. Oxfordshire County Council have yet again postponed the meeting to consider the quarry planning application. It will now NOT be on 4th March. The next possible date is Monday 15th April at 2 pm @ County Hall. Please pencil it in your diary. It is certainly possible that the date for the hearing will slip again. We will keep you informed on the website and by email. Collectively we defeated Hills then and we can defeat them again. Autumn 2018 Update: What’s happening with the quarry? Many of you will be wondering what is happening with the Quarry. We expected the application to be heard in late October, but have now been informed the decision will be delayed again. The date of the next potential Committee meeting is Monday 10th December. The transport control officer Geoffrey Arnold has not been persuaded by Hills’ arguments and has lodged an objection stating the traffic impact of the development “would meet the NPPF criteria of ‘severe harm’ so as to justify the refusal of planning permission.” He says the hours proposed by Hills to restrict quarry traffic do not go far enough. If approval was recommended he would require a condition to prohibit all vehicular traffic from entering or departing the site between 7.30-9.15 am and 4.00-6.30 pm, together with realistic and practical options for enforcement of the vehicle restriction for him to remove his objection. We wait to hear what the council has to say on the other grounds for refusal, in particular whether there is any justification for this development in the Green Belt and conflict with the safeguarded land for a new river crossing. Hills were defeated in Nov 2017, but have not gone away. They have lodged a new planning application (ref: MW.0074/18). Clifton Hampden and Burcot Parish Council’s official response to this application can be viewed here: CH&BPC Response July 18 (see p.34 for the overall conclusion). Save the date: The application will not go to committee on Monday 10 September. The next possible date for the Committee meeting to decide the outcome is Monday 29 October. Your attendance is strongly encouraged – the impressive turnout last time made a difference. The changes between the two applications are minor and insignificant. Traffic, Green Belt, Environment, Economic Growth: all are spoilt. The ~800 objection letters sent last time really made the difference – Councillors were in no doubt about how you felt. It is important to write again about this new application – your letters will count. Many of your neighbours have already done so and as a community we hope to get more than 1000 this time. The main arguments against the quarry are set out here. You can copy any or all of these, or write your own. This quarry will destroy the tranquillity and openness of the Green Belt. It is inappropriate development for which there is no justification. Oxfordshire now has 20+ years of supply. This quarry will permanently desecrate the landscape. Most of the trees, hedgerows and natural habitat will be removed, and public footpaths will be lost. Queues which are bad enough now will be made worse by an additional 80 lorries a day. There will be risk to the safety of schoolchildren, pedestrians and other road users at Clifton Hampden lights. More lorries means more pollution, in Clifton Hampden and in Abingdon. The quarry threatens the new bridge and link road, Oxfordshire’s top priority infrastructure project. This road is desperately needed to promote growth at the Culham Science Centre, and to relieve pressure on the bridges and Clifton Hampden and Culham. Donations by cheque (cash) can be left at the village shop, or post to Giles Baxter, Lower Town Farmhouse, High St, Clifton Hampden OX14 3EQ. All donations are kept in strictest confidence. Thank you for your continued support. It is time to get this thrown out once and for all. The additional vehicle movements arising from the development would lead to severe highways impacts contrary to paragraph 32 of the National Planning Policy Framework; would not maintain the safety of road users and the efficiency of the road network contrary to Oxfordshire Minerals Waste Core Strategy policy C10 and would contribute to congestion, disruption and delays on the road network, contrary to Local Transport Plan policy 02. The additional vehicle movements arising from the development would worsen queuing at the local junctions leading to stationary vehicles with associated air emissions, causing unacceptable adverse impacts on environmental amenity, contrary to Oxfordshire Minerals Waste Core Strategy policies C5 and C10. The development would prejudice the future development of a new link road and Thames crossing along one of the routes safeguarded by policy TRANS3 of the emerging South Oxfordshire Local Plan 2033 and core policy 18 of the adopted Vale of White Horse Local Plan 2031 Part 1 contrary to these policies. The development is inappropriate in the Green Belt contrary to Oxfordshire Minerals Waste Core Strategy policy C12, South Oxfordshire Local Plan policy GB4 and National Planning Policy Framework paragraphs 87, 88 and 90 and no very special circumstances exist to justify making an exception to these policies. Despite the overwhelming rejection by Oxfordshire County Council’s Planning Committee last November, the threat from Hills Quarry Products to create a quarry on land at Clifton Hampden has not gone away, and your continued support is needed. Oxfordshire County Council’s planning officer Mary Thompson recently informed Lorraine Lyndsey Gale (the county councillor for Clifton Hampden) that Hills are intending to submit a new planning application rather than appeal the refused application to an inspector. This fresh move from Hills suggests they do not think they can win an appeal and confirms our view – that the refused application is deeply flawed and inappropriate. The deadline for the company to mount an appeal is the end of this month. We remain alert to any new moves from Hills and will keep you informed of further developments. Thank you for all your support thus far writing to the council to make the views of the community heard. In accordance with the new Data Protection requirements for consent to hold your information, please be informed that unless we hear to the contrary we will continue to hold your details on our database to keep you informed of the quarry campaign. Your details will only be used for this purpose and will not be provided or published to any third parties. If, however, you wish to unsubscribe, please email us at bachport@btinternet.com. The four parish councils – Burcot and Clifton Hampden, Long Wittenham, Appleford and Culham – remain united in their view there is no need for a new quarry, and this is the wrong place to put one. A quarry would destroy this scenic landscape by the River Thames, causing immense harm to the Green Belt, and enjoyment of this area by residents and visitors alike. We are delighted to report back from the Planning Committee meeting today that the quarry application has been refused. Yes, refused. This is an excellent outcome. It is reflective of the hard work, perseverance and strength of community support that has gone into the campaign and we would like to say thank you to all those who have contributed in numerous ways over recent years. (i) The additional vehicle movements arising from the development would lead to severe highways impacts (contrary to the National Planning Policy Framework); would not maintain the safety of road users and the efficiency of the road network (contrary to the Oxfordshire Minerals & Waste Core Strategy; OMWCS) and would contribute to congestion, disruption and delays on the road network (contrary to Local Transport Plan Policy). (ii) The additional vehicle movements arising from the development would worsen queuing at the local junctions leading to stationary vehicles with associated air emissions, causing unacceptable adverse impacts on environmental amenity (contrary to the OMWCS). (iii) The development would prejudice the future development of a new link road and Thames crossing along one of the routes safeguarded by policy in the emerging South Oxfordshire Local Plan 2033 and the core policy of the adopted Vale of White Horse Local Plan 2031. (iv) The development is inappropriate in the Green Belt (contrary to the OMWCS, the South Oxfordshire Local Plan and the National Planning Policy Framework) and no very special circumstances exist to justify making an exception to these policies. We need you. Please show your support by attending this meeting. Your support is essential to show community opposition to a planning application that has raised serious concerns on multiple levels, not least by the Council’s Highways Authority (HA), which has said the quarry would cause “severe harm” to road safety, threatens air quality and ousts plans for a much needed new road link and river crossing between Didcot and Culham. Responding to the council’s fourth consultation on the quarry, the HA highlighted the results of recent detailed surveys and modelling work on junctions in Culham and Sutton Courtenay in connection with the development of Didcot Garden Town. It also carried out queue length surveys at the staggered crossroads of A415, B4015 and High Street at Clifton Hampden. Mr Arnold also has worries about an increase in lorries using the quarry travelling through Abingdon town centre. He says extra HGV movements have implications on air quality for the town and urges further consultation. In advance of the meeting on 27 November, the council has released papers which, at first glance, look promising, as refusal of the quarry application is recommended on the basis of the traffic issues. However, the quarry applicant has since met with the council and suggested ways in which quarry-generated HGV movements may be limited at peak travel times. How the Planning Committee respond to this gesture may well dictate the outcome. We’re asking for you to show your support and opposition to the quarry by attending the meeting and reminding the decision-makers that their choices affect real people, residents and tourists alike, daily commuters, local businesses, Culham Science Centre employees, school children, the environment, the Green Belt – in a nutshell, all of us and our future for years to come. (Above) Snapshot of backed-up traffic at 4.30 pm (20 Nov) outside Culham Science Centre. Oxfordshire County Council have launched a 4th round of public consultation on new information provided by Hills. We believe the application will go to the planning committee late 2017 or early 2018. We urge you to write and object to OCC by Thursday 2 November. The main change is that Hills have removed the concrete plant. Don’t be fooled. This is a purely tactical move to get round Green Belt planning policy. Hills applied for a concrete plant at their new quarry in the Green Belt at Besselsleigh once planning permission for the quarry had been granted, through a ‘Permitted Development’ application, which only requires approval by OCC. No public consultation is required. Hills have retained the site for the concrete plant on their plans, together with the massive bunds, a sure sign of their true intentions. Hills have proposed lots of new hedges and tree screens to surround the site edges and the footpaths. But these will enclose the whole of the Thames Path and the diverted footpath in the vicinity of the site, such that there will be no open views to be enjoyed any more. Hills haven’t proposed to reinstate these open views for either walkers or residents when the operation is complete. These screens will destroy the openness of the Green Belt, which we think is unacceptable to public and residential amenity. If Hills were serious about improving the landscape impact they could have reduced the length of the enormous bunds around the plant area following the removal of the concrete plant. The proposed bunds are the height and length of a street of 3-storey terraced houses and will be in-situ for the duration of the quarry. Reducing the scale of these would have a far more beneficial impact on landscape. Hill’s claim the objections of the planning authority and statutory consultees have now been addressed. However both South Oxfordshire District Council and OCC Highways objected to the quarry as the application fell within the area under consideration for the new river crossing. Since then SODC have released their Final Publication of the SODC Local Plan 2033 which safeguards the majority of the quarry site for the much needed road and river crossing. SODC and OCC have now applied to central government for full funding for the road scheme which, if granted, could see the road development start within 5 years. The road is much more important to Oxfordshire, the Culham Science Centre, businesses, and local residents than the quarry, so it would be madness to allow the quarry to scupper the road. Since Oxfordshire County Councillors voted in favour of the Minerals Plan last month which they use as justification for a new quarry, the Government have revised their calculations for future housing requirements sharply downwards. This fundamentally undermines the applicant’s case that the quarry is needed to meet additional demand. Furthermore, the amount of sand and gravel dug up in the county fell by 15% despite forecasts by OCC to the contrary, and despite all the new houses going up. Hills claim that the quarry will produce 250,000 tonnes of material a year but the county used only 680,000 tonnes from existing five quarry sites last year, and one quarry remains mothballed! The numbers just don’t stack up – production is bound to be lower at least initially and this quarry will last not 10 years but 20 years, creating long-term environmental blight for our four villages and this beautiful area of the River Thames valley. We urge you to write and object to OCC by Thursday 2 November. Please write even if you have objected before. OCC need to know that you still feel strongly about this application even though it has gone on for so long. In your letter, please refer to the new information and state that it does not address your concerns and your objection still stands. Loss of high-grade agricultural land. Trees of arboricultural value and almost 3 km of species-rich ancient hedgerow, which will be removed. Traffic through Abingdon and the A415 through Clifton Hampden. Details of the enormous bunds around the site which will be visually intrusive, difficult to maintain, and prone to slumping. The new information showed a much higher loss of high-grade agricultural land than previously indicated, and this loss was not justified. This is counter to National Planning Policy. The new information did not address the presence or absence of veteran or biologically important trees, as required by National Planning Policy. Hills merely stated that they had not identified any veteran trees. Hills refused permission for Dr David Lonsdale, a world-renowned tree expert, to access the site. Dr Lonsdale had identified 40 trees that merited further investigation. Why are Hills so worried? The survey would take less than a day and would not be intrusive or damaging. Hills should have nothing to fear from one of the country’s leading experts on trees visiting the site. Or, perhaps they do, because there are important trees, protected by National Planning Policy, that they have failed to take into account in their scheme. Hills have been wrong before. Their initial claim was that the site contained nothing of archaeological importance following their extensive archaeological survey by professional consultants. Historic England disagreed and designated 25 hectares of the site as a Scheduled Ancient Monument. Hills have also been forced to admit that their previous assessment of the agricultural value of the land was wrong. Hills did not provide evidence or justification on why they departed from the advice given at the time of the scoping opinion. They did not address concerns regarding the impact of HGVs on existing congestion problems around the Clifton Hampden junction/lights. They continue to ignore the impact that their quarry will have on an already congested road network. Hills provided further information on the massive bunds that they will need to construct to reduce dust and noise. They are now 10 m high in places, the height of a 3-story house. They will be prone to slumping, and difficult to maintain. This is highly obtrusive and will have a significant impact on the openness and tranquillity of the Green Belt. For your information, the Bachport response to Consultation No. 1 can be found here. The response to Consultation No. 2 can be found here. In a letter to Oxfordshire County Council (OCC), the Environment Agency (EA) has retained its objection to the proposed quarry. Why? Hills’ Flood Risk Assessment (FRA) does not comply with the requirements set out in the National Planning Policy Framework and thus doesn’t provide the right information for a full assessment of flood risks arising from the proposed development. The National Planning Policy Framework states that development should not be permitted if there are reasonably available sites appropriate for the proposed development in areas with a lower probability of flooding. While Hills’ FRA shows some overall increase in volume of flood plain storage under some conditions, they have not demonstrated how they could compensate for the loss of flood plain storage in other conditions. The FRA allows for small events in climate change but does not factor in larger events. Hills need to show how they will prevent the proposed development reducing flood plain storage and displacing flood waters, thereby increasing flood risk elsewhere. Hills have not provided satisfactory clarification on watercourse and ecological mitigation. They have not answered the EA’s questions on grassland and hydrology, and need to rectify their contradictory statement regarding the use of artificial flood lighting. Inconsistencies in bund height and missing figures in their application have also been flagged for attention. With regards to post-quarry restoration plans, the EA points out that the proposed lake for sailing/boating/fishing appears to be missing infrastructure to support it; there are no fishing platforms, access tracks or paths, slipways, site office or facilities marked on Hills’ plans. In short, Hills has not provided the necessary information and OCC should not determine the application until they have done so. We and our professional advisors reviewed the AI supplied: it has not changed the substance of the proposal and there are still very strong grounds on which the application should be rejected. OCC requested Winter viewpoints of the site. These have still not been supplied. Thus the landscape and visual assessment remains inadequate, and fails to properly assess the potential harm of the quarry, which will be significant and irreversible. A full survey of trees and hedgerows has now been supplied and confirms all trees and hedgerows scheduled for removal are significant for their landscape and conservation value, and should be retained within the design of the development. Soil sample data for assessment of agricultural land value has now been supplied and shows that, contrary to their submission statements, the majority of land is ‘best and most versatile’ (BMV). More than 2.5 x the amount of BMV land they claimed is lost is actually lost on restoration. This contravenes national and local policy requirements to preserve BMV land. Existing (i.e. ‘quarry-free’) noise readings were required from neighbouring properties to the proposed site. These were much lower than expected so Hills would need to put in higher, longer bunds to shield residents from the extra noise. However, in terms of landscape impact, such a size would be unacceptable. Long Wittenham residents cannot be protected from noise by bunds along the southern edge of the site because bunds here would impede the land’s natural floodwater capacity. Hills haven’t addressed a single one of our water consultant’s concerns, some of which are ‘fundamental’ planning issues. They have provided more modelling, which has shown (a) they can’t accurately predict flood events, and (b) an increase in flood risk during some stages of quarry working. They also haven’t properly assessed effects on the Lower Greensand aquifer (under the sand and gravel layer), which runs underneath the science centre and railway line. Bachport and the Culham Science Centre concerns about traffic impacts have been dismissed without presenting any evidence to support Hills’ assertions that traffic impacts are minimal. They dismissed our traffic survey (which showed significant additional traffic delay at the village junction) as lacking independence, even though it was conducted by Paul Silcock, an expert in signal modelling. Our survey remains valid until they produce actual evidence to contradict our assessment. There was a distinct paucity of ecology survey work with the initial application, and further survey work was required including bats (they are a National and European protected species). While Hills suggested the site was unlikely to have any significant bat interest, the survey shows the site is actually used by 8/14 Oxfordshire bat species, some of which are rare for Oxfordshire. Loss of mature vegetation would have a significant impact on this bat population yet has not been adequately addressed in Hills mitigation proposals. Hills have suggested the new planting on restoration will be ‘mature’ in 15 years; an ironic assessment when their Arboricultural survey suggests that many of the oaks, ash, poplar and willow proposed for removal, and which have been present for more than 150 years, form mostly ‘early mature’ vegetation. There is no need for this quarry to meet the county’s sand and gravel requirements. The OCC Minerals and Waste Plan is still being formulated. 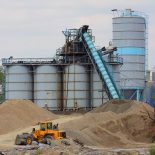 Sales figures show the need for sand and gravel has already fallen over the Plan’s period. The landbank of existing reserves is more than sufficient for at least another 13 years. Any favourable determination of this quarry at this time would pre-empt the emerging Plan, and would be directly contrary to government policy that major development should be Plan-led. Oxfordshire County Council have begun a 2nd round of public consultation on the quarry. The planning decision will depend on this consultation response. Please can you WRITE AGAIN by 1ST MARCH. Hills have supplied further information – but nothing in their proposal has changed. Bachport’s concerns have not been addressed. The Culham Science Centre’s concerns have not been addressed. The quarry will generate significant, long-term, negative impacts – on our four villages and on visitors using the Thames and Thames Path. If you previously objected, please write again or resend your letter. Say nothing has changed from the new information and repeat your objections. Speedwell St, Oxford OX1 1NE. If you haven’t written before and would like to, now’s your chance. Bachport have set out a strong case for refusal – we need this supported with your objections. Your email today may take a minute or two but could affect the countryside and the local community for the next 10 to 25 years. You can make a difference. Together, the community can make a difference. Hills have now come back with the additional information requested by Oxfordshire County Council (OCC) last August. The initial quarry application failed to provide essential information on a number of key areas. Second time around and Hills have still not done a good job. Firstly, the required information is incomplete and there are at least 6 areas where Hills have not provided the information requested by OCC. We have written to OCC pointing out these deficiencies. Why are Hills treating the process with contempt? Secondly, and true to form, Hills have made the new information deliberately difficult to find and analyse. It is buried within a mix of 60 new and revised documents (without tracked changes). What have they got to hide? As an example, some information on trees is now provided (glaringly absent in the original submission); however, it is still not clear which veteran trees will be saved and which are for the chop, and the maps provided are unreadable. Why not just be clear? Bachport and its advisors are painstakingly analysing the new information and preparing our own submission for this second round of consultation. We continue to have a strong case and strong support for getting this planning application rejected. Representatives of the 4 parish councils have met and remain united in their opposition. We have successfully done a second round of fundraising to pay for our advisors, and have a dedicated core team in addition to nearly 850 registered supporters. In the first consultation more than 600 letters and emails were sent to OCC protesting about this unwelcome development. The scale of local opposition was certainly noticed by OCC. Please could you take the time to write a short email of your objection to OCC at the address below, even if you have done so before. It really does make a difference. There are so many reasons to object to this application: destruction of the landscape, creation of massive 10 m bunds (the height of 3-storey houses) in the green belt, the removal of most trees and hedgerows, traffic congestion, noise, dust and increased risk of flooding. The new information supplied by Hills doesn’t answer the questions we and other bodies raised in the first round of consultation. The winner of the Bachport Visual Arts Competition is Tim Widdowson for his beautiful and haunting watercolour, Dust to Dust. Congratulations to Tim, thank you and congratulations to all our runners up: Primrose Baxter, Eirian Griffiths and Camilla Seaward and to all our entrants. Thank you to our judges Clare Owen, editor of The Bridge, Giles Harvey, filmmaker and Gary Cooper of Fabulous Flowers. In response to the request by Oxfordshire County Council for further information, Hills Quarry Products have submitted their revised plans for the sand and gravel quarry between Clifton Hampden and Culham. The Bachport committee is in the process of assessing these plans, working in conjunction with the parish councils of Clifton Hampden/Burcot, Long Wittenham, Culham and Appleford. We will be in touch soon with all our supporters on what’s changed and how, through public consultation, you can help fight this blight on the landscape and our community. For your information, the revised application materials can be viewed on http://myeplanning2.oxfordshire.gov.uk under the same reference as before, MW.0039/16. The photo/picture/painting competition for your artistic expressions of how you feel about the prospect of a gravel pit and concrete plant being built on the Oxfordshire Green Belt, overlooking the beautiful, tranquil River Thames and the Thames path, has now closed. A big thank you to all who contributed for your inspired entries. The judges are Clare Owen, editor of The Bridge, Gary Cooper, owner of Fabulous Flowers in Abingdon and filmmaker Giles Harvey of Luttrell Productions. Information will be available in due course of the winning entries. The Barley Mow has very generously donated a fantastic dinner for two (all food and drink included), which is first prize for the Adult section. The two winning entries will appear on the front and back cover of The Bridge. All runners up will receive a Bachport #sorrybutNOquarry T shirt. Crucial work on seeking a new source of clean energy at the Culham Science Centre could be damaged by dust from a proposed sand and gravel quarry says a report to Oxfordshire County Council. Hills Quarry Products wants to create a huge quarry on Greenbelt land alongside the Thames at Clifton Hampden but the plans have been met with a storm of protests. The Culham Science Centre (CSC) is opposite the quarry. CSC is the leading UK centre for fusion research and technology and is of international importance in the quest for a new source of clean energy. It says the air quality threat posed by the proposed quarry has not been sufficiently addressed. The Culham site is part of South Oxfordshire District Council’s core strategy for redevelopment and research and science based businesses supporting up to 1,000 new jobs. It is one of the cornerstones of the council’s employment strategy and a major part of the Science Vale cluster of science and technology businesses. It says that the scope and timings of the ecological survey work carried out are inadequate, in particular for foraging and commuting, water voles, otters and grass snakes. The EA says the Thames needs protecting with a 25 m fenced buffer and pollution protection measures. “The scope and timings of the ecological survey work carried out are inadequate, in particular for roosting, foraging and commuting bats, reptiles, great-crested newt and breeding and wintering birds.